Grand Villa of Ormond Beach was beautiful and very nice. My mom wouldn't have been able to afford the single room and she would have had to share, so she wouldn't have been able to have her furniture. She would only have a dresser. The one room we saw was just one big room with two beds for two separate people. They had one dresser and they each had a TV. I don't know how they'd do that since they're both going to be watching something different. The staff was very nice and accommodating. They try to be helpful. They had a card room with people playing cards. The place was very clean and the grounds were very pretty with outdoor sitting areas. Jul 20, 2017 | Reviewed by Pat L.
The tour at Grand Villa of Ormond Beach was good. There were two people per room unless you go for the higher-priced ones. The staff was doing really well and were really friendly. The best way to get to know a community is by scheduling a tour. See the facilities, meet the staff and residents, and get a feel first hand what it's like to live at Grand Villa of Ormond Beach Assisted Living. At the Grand Villa of Ormond Beach, you will find a supportive community where your senior years can be enjoyed, just a hop skip and a jump from gorgeous white-sand beaches. We will handle the necessities and the basics of care freeing you to spend the time doing what you love. Grand Villa of Ormond beach is proudly managed by Senior Management Advisors. Formed in 2001, we operate a full spectrum of residential senior living communities throughout the Southeast including living, assisted living and Alzheimer's care. Our community has been designed with residents in mind. 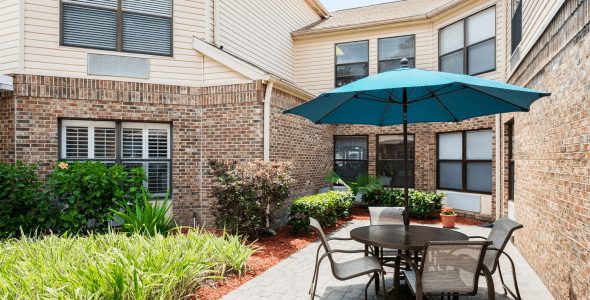 Our amenities are easy to access and there are several outdoor areas for you to take advantage of the beautiful Florida sunshine year-round. Our chefs prepare three delicious meals each day, served in a tasteful restaurant-style dining room. Plenty of daily activities are available to suit the tastes of residents, from our gardening club, chair yoga, Zumba and even Wii bowling competitions. You will have a choice of home styles to choose from, including cozy studio and comfortable one-bedroom apartments. Each unit comes complete with individual climate control, a kitchenette, spacious closets and wall-to-wall carpet. At Grand Villa of Ormond Beach, utilities (except for phone) are included in your monthly rate and there is no need to worry about household maintenance or chores when our caring staff is available to handle it. We understand that each resident has different needs at the Grand Villa of Ormond Beach which is why we'll craft a personal care plan that respects your individual needs. Our supportive services cover the basics housekeeping, laundry and linen service, but extend to medication management, bathing and dressing assistance, morning and evening help, and appointment setting among other services. Our compassionate staff understands the needs of seniors and will go out of their way to ensure that you can benefit from the most supportive environment possible. We welcome you to join us at Grand Villa of Ormond Beach where you will find a home, family and community to enjoy.